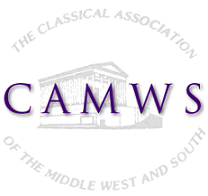 The legal name of CAMWS is the Classical Assn. of the Middle West and South. Your contribution is used to support the various outreach activities of CAMWS. You may designate your gift for a specific use. In particular the CAMWS Development Committee this year asks you to support its special "Latin Teacher Training Initiative." Click here to read a letter about this initiative from the chair of the Development Commmittee, John Miller at the University of Virginia. No contribution to this initiative is too small but if you contribute $100 or more you are invited to designate it in honor of one of your own Latin teachers. The names of these teachers will be listed in the CAMWS newsletter and in the 2019 meeting program. If you do make a contribution of $100 or more to the Latin Teacher Training Initiative", please add a note to your Paypal (or send an email to camws@camws.org) with the name of your teacher honoree along with the school and state or province in which the school is located. For what use would you like to designate your gift? CAMWS is an educational, not-for-profit organization. It is exempt from federal income tax as a public charity under §501(c)(3) of the Internal Revenue Code. Current law permits individuals to treat donations to CAMWS as charitable contributions. Please consider remembering The Classical Association of the Middle West and South, Inc. in your will.